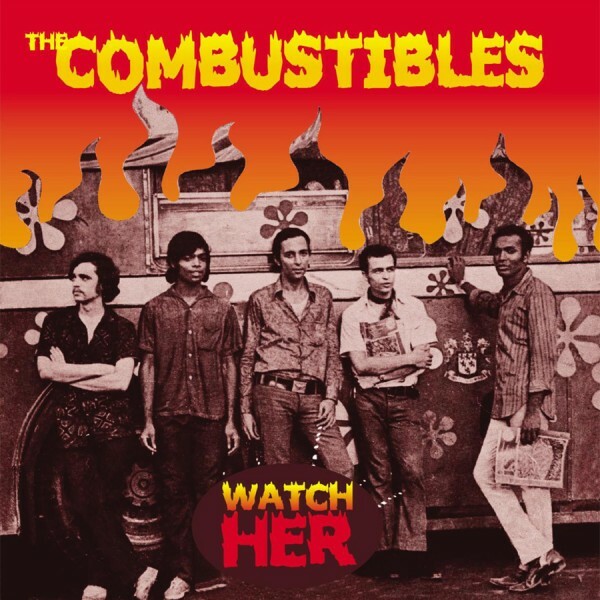 The Combustibles’ overall sound was driven by Everett’s vocals, Lionel’s soaring lead guitar and George’s pounding bass and excellent vocal harmonies. These talents meant that the band was able to interpret and build on original versions of songs and its sound generally featured a fair bit of improvisation on vocals and guitar, thus adding some originality to an overall repertoire that was still heavily stocked with cover songs. To support this extensive improvisation, the sound of The Combustibles became heavier over time with Lionel’s extensive use of the fuzz-wah pedal adding a raw edge to the mix. 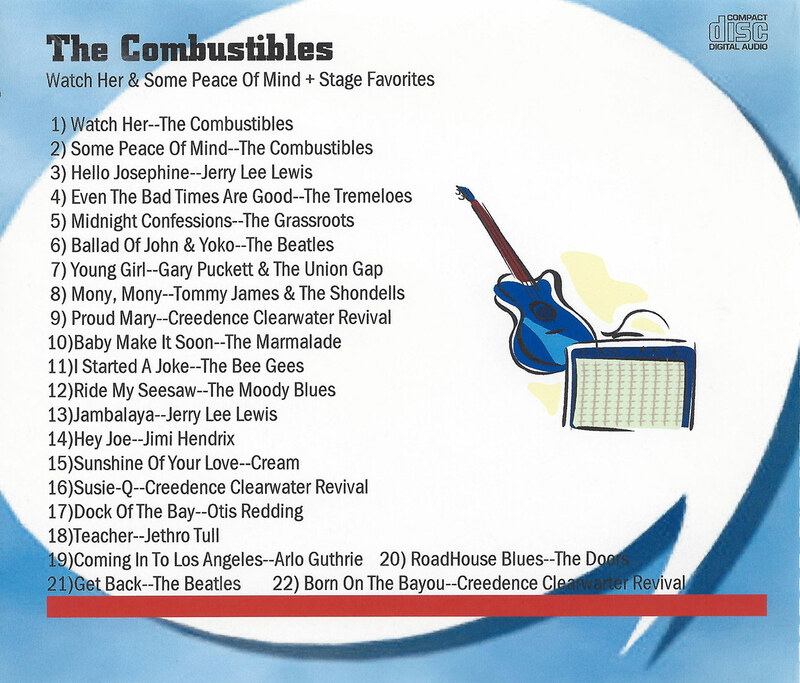 Very heavily requested covers of Hendrix’ Hey Joe, Cream’s Crossroads and Sunshine of Your Love, Zeppelin’s Livin’ Loving Maid and American Woman by Guess Who were reflective of The Combustibles’ sound. Everett’s original compositions apart, The Combustibles repertoire had a distinctly “classic rock” flavor, with a fair bit of soul thrown in for taste. In the absence of a keyboardist the music was essentially guitar based – hence a lot of Creedence Clearwater Revival, Cream, Jethro Tull, Guess Who, Ten Years After, Beatles and the Doors – in the latter case including songs (such as Roadhouse Blues and Love Me Two Times) which lent themselves well to a pure guitar sound. 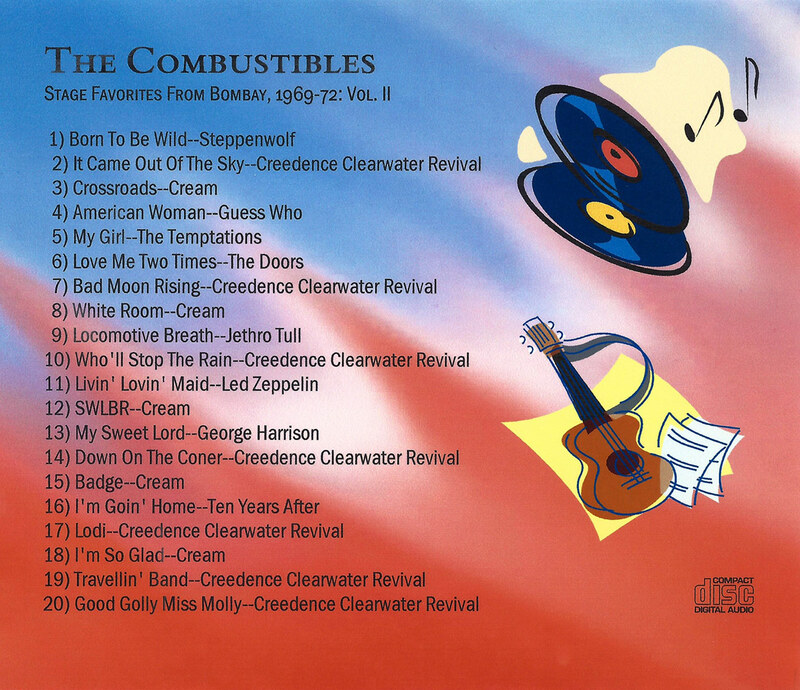 In fact, in terms of covers it was CCR that dominated The Combustibles song-list – nothing like listening to Everett being Born On The Bayou. The ability of Everett and George to harmonize exceptionally well also allowed songs such as The Moody Blues’ Ride My Seesaw to serve as the highlight of the set-list. Everett’s vocal style was also well suited to classic soul hits such as My Girl, In the Midnight Hour and Sittin’ on the Dock of the Bay. Mony Mony by Tommy James and The Shondell’s was often an opening number, while songs by The Tremeloes (Even The Bad Times Are Good), the Bee Gees (I Started A Joke), The Marmalade (Baby Make It Soon), The Grassroots (Midnight Confessions) and Union Gap (Young Girl), rounded off a repertoire that was varied enough to meet the diverse needs of the different audiences and events that we played for. 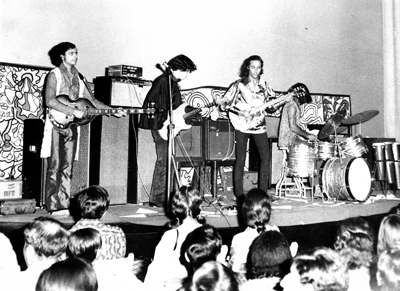 Of the five Everett Perry compositions that The Combustibles played regularly, the first four were recorded in 1970 at a small studio in Worli in central Bombay. While original plans called for all four to be released as an E.P. 45 rpm, eventually – due to production difficulties – only Watch Her and Some Peace of Mind were released on a 45 rpm single. Both were essentially blues driven rock songs, played hard the way the band normally performed them live with Lionel improvising for the first time the searing fuzz-driven lead solo on Watch Her that became the way the song was played ever since! Hey Doc was a slow repetitive blues mix, while There’s A Love was a beautiful slow ballad with exceptional harmonies which George sang on live performances; but in the studio, Everett double-tracked both the harmony as well as the lead vocal. There’s A Love also contained an incredibly beautiful wah-wah based lead guitar solo in which the key of the song changed abruptly from A to B-minor, with a fleeting pass through D flat! Some Peace of Mind was originally recorded with a very heavy beat and extensive use of fuzz and wah-wah pedal effects both in the intro, during the song itself and particularly during the guitar solo. It was the perfect complement to the live version the band played. Unfortunately, a record company music manager popped into the studio late in the day and insisting that the Bombay audience was not ready for the type of gritty sound that had been reproduced in Some Peace of Mind. He insisted the song be re-recorded with the guitar simply on regular setting and very limited use of fuzz or wah-wah! That was done, of course, though with limited enthusiasm from the band, and the final release included this end of day re-recording!! It is the only recorded version now available and is on the Harkit Records release on Record Store Day 2013. However, the only time the song was played in the fashion heard on the record was during that one re-recording. The “live” version, so often asked for by audiences till the band broke-up, continued to be played in the way the song was meant to be heard!! The second tragedy of that recording session is that the excellent recording of There’s A Love and Hey Doc was never released and the masters have been lost to time! So much for the travails of Bombay rock bands in those days!! Now Watch Her, you better watch that baby now. She thought I’d sit and start mournin’ oh boy! But I never even did cry. For then, I’ll have my love. Hey Doc, what d‘ya do? And the black night settled in my soul. Why can’t I lay down and die? Apart from Everett Perry’s original compositions, the band’s setlist was varied enough to meet the needs of the diverse audiences they played for.